I. Introduction. Choice of information. Clay mineral names and structure. Chemical systems. Stability and meta-stability. Stability and reaction rate. Geological environments. Chemical coordinates for phyllosilicates assemblages. Summary. II. Minerals and Mineral Groups. Silica. Kaolinite, pyrophyllite, gibbsite and talc. Chlorites. Zeolites. Sepiolite-palygorskite. III. General Phase Diagrams for Some Clay Mineral Assemblages. Introduction. General systems. Weathering. Hydrothermal alteration. Deep sea basalt alteration. Mixed layered minerals in sequences of buried rocks (P-T space). Conclusions. References. Index. This book follows another by the same author, published in 1977, which the author considered as a first attempt to put some order in the house of clay petrology''. That book was described asan excellent first attack on clay mineral petrology... informative, and stimulating because of the method of presentation and the open-door treatment of the subject. Not only clay-mineral scientists but petrologists in general must read this first book on clay mineral petrology.'' (Earth Science Reviews). 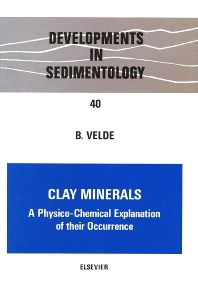 This book describes clay mineral occurrence in terms of the physical and chemical forces which influence it. It includes a geological description of mineral occurrence, a definition of the major features of clay mineral chemical composition, and an indication of the physical-chemical boundaries of these occurrences. It also presents general patterns for the geological environments of weathering, sedimentation, burial diagenesis, deep sea basalt alteration, hydrothermal alteration of acidic rocks and chemical precipitation in acidic and basic environments. The major clay groups are related to one another as they occur in geological systems through the use of graphical analysis. The author has thoroughly reviewed the relevant literature for the last 25 years. The data and analyses obtained and presented in this book will not only make interesting reading, but will also prove extremely useful to those involved with studies in deep sea research, mining geology, petroleum geology, agronomy and civil engineering.